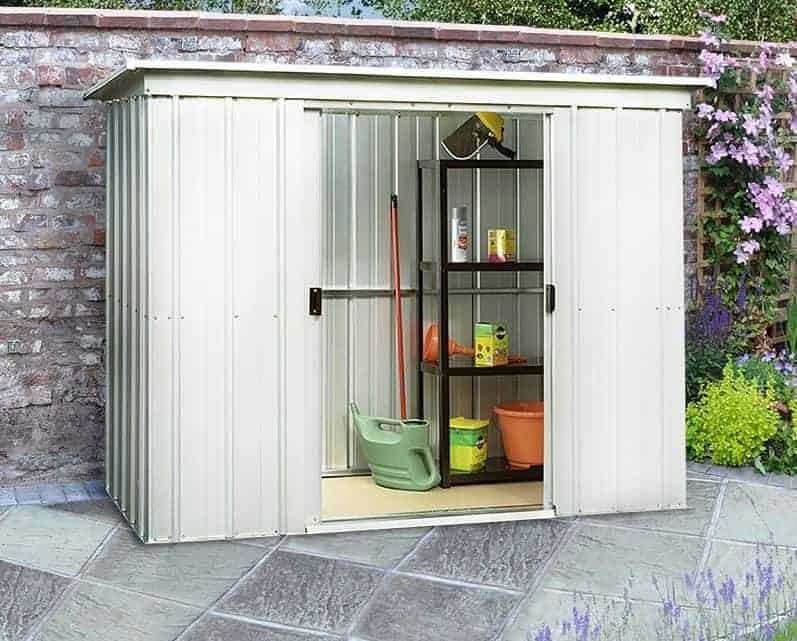 This mid sized garden storage shed offers great value for people who are looking for more space to keep their tools and equipment, safe from the elements and from the prying eyes of potential shed thieves. Whilst we wish that the double doors would have been a little taller, we were impressed by their width, and the width of the shed as a whole is generous. 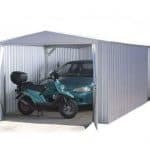 For that reason it’s ideal for storing bicycles, ride on lawn mowers or mobility scooters. The cladding of the shed has undergone a hot dipped galvanisation process during the manufacturing process, which helps to ensure that rain is kept outside and that rust is therefore discouraged. The pent roof also helps with this weatherproofing, as rain slides harmlessly away instead of remaining on the surface. Because it lacks windows, the privacy, and therefore security of the shed is enhanced, as nobody will be aware of what’s kept inside. Be aware, however, that a padlock or alarm system will need to be fitted if you intend to use the shed to store anything of value. These items aren’t included, although the door handles are designed so that a standard padlock can easily be fitted. We liked the fact that this pent shed has a wide frontage, compared to its depth, as this makes it not only a good choice for storing objects such as bicycles, it’s also a perfect fit for shallower gardens. The zinc finish really catches the light, making it look almost white at times, and giving it a very contemporary look. The pent roof gives a major advantage over flat roofs, in that it stops water sitting on the surface, but on a shed with a restricted height such as this one we would have liked the extra inches that an apex roof provides. At its maximum height the shed measures 1.74m, and it has an eaves height of 1.60m. The overall width is 2.98m, with an overall depth of 1.19m, and this wide facade gives the shed added versatility. We were pleased that the corrugated cladding features three distinct layers, as metal sheds can be very prone to rust if sited in exposed areas without adequate protection. The first layer is the steel core itself, which is then given a zinc plated finish through a process of galvanisation. This is then coated with a plastic resin, it can’t be seen but it helps prevent rain from getting to the metal below it. 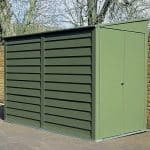 As with most metal sheds, it’s designed to be installed upon a flat, ideally concrete, surface so no flooring is included. An anchor kit is included, and this makes it quick and easy to secure to a pre-existing base. 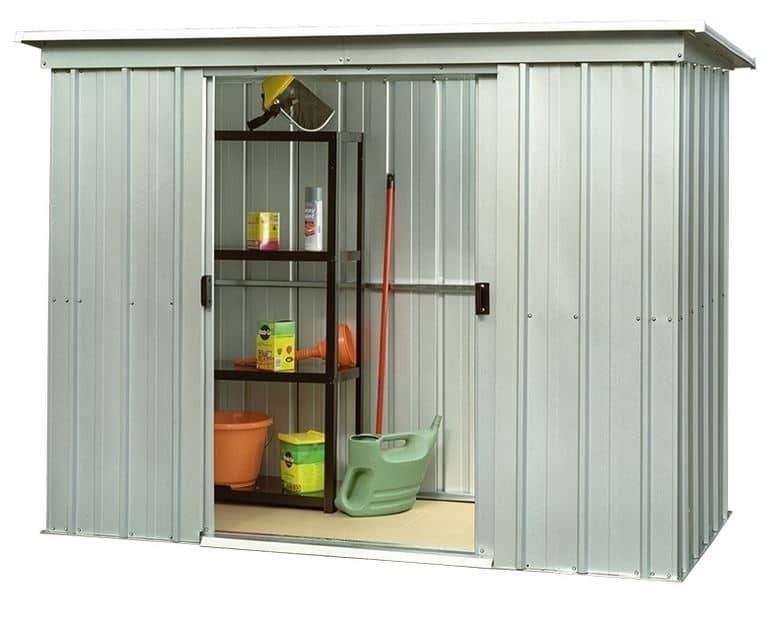 The screws supplied are made of rust-resistant stainless steel so you won’t have to worry about these essential components corroding and ruining the shed’s aesthetic appeal. As with all metal sheds, no treatment is required, which can bring substantial savings in time and money compared to traditional timber sheds. The galvanisation process used by the manufacturer prevents rust formation as well as toughening the steel, so we would have welcomed a longer guarantee against rust than the 10 years provided by Yardmaster. The sliding double doors are centrally positioned on the face of the shed, so we found that they gave easy access to the interior as a whole. Featuring an interior setting, they have extra protection from knocks and bumps. 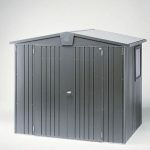 They have a width of 1.20m, which is much wider than most metal sheds in this price range. On the other hand, the height of the door is only 1.58m, meaning that access into the shed will involve stooping for most people. There is no window included, although the wide opening ensures that all corners of the shed are illuminated naturally while the doors are open. The window free design is a feature often featured in security sheds, as it prevents would be intruders from seeing what’s inside. Without this information they are much less likely to target the shed. 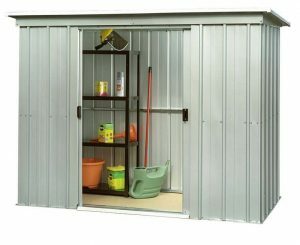 In its standard form, however, the shed is not suitable for use as a secure storage facility because it locks a padlock. The handles are holed so that a padlock can be attached to them, and we’d recommend this to all owners of this shed, whatever they plan on keeping inside. We were glad that a suitably sized shelving unit is available as an optional extra for this shed, as once tools and equipment are stored in an organised manner it’s easier to make full use of the space available. The 2’6 X 1’8 unit includes four resin shelves, and is easily fixed together. Another optional storage solution is a wheel bearing tool rack, manufactured by Tool-Plus. In a similar vein, a high quality wheelbarrow is available from Bull Picador, as is an Outdoor Water Station, perfect for people who want a more environmentally friendly way to water their garden. 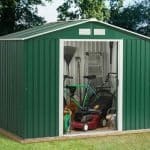 All of these items can be fitted inside of the shed when not in use, while still leaving enough room for a mower, spade, and more. We were impressed by both the toughness that the galvanisation process brought, and the clear plastic coating that tops up. It’s an attention to detail that is replicated throughout the shed. The pent roof and corrugated galvanised cladding both help to prevent the occurrence of rust, but thicker cladding would have extended the life still further. The wide front means that more items can be stored inside than you may think, particularly if stand alone shelving units are used. On the other hand, the depth and height both detract from the overall storage capacity. We found the instructions simple, yet easy to follow. There are lots of components that need tapping into place, so this can extend the overall installation time, but you and a friend should be able to complete it in approximately six hours. 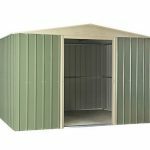 This offers good value for money, especially when compared to some metal sheds of a similar size which require anchor kits to be purchased separately. A longer guarantee would have added to the overall value. Final Thoughts: Not all gardens are the same size and shape, so if you have a shallow garden that you’d like to add a storage facility to, this could be an ideal choice. 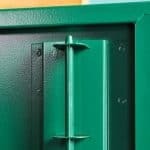 The internal doors add to the overall appeal and to its modern feel, and with the addition of a padlock it can become a secure option for keeping your valuable tools out of sight. Because rain is kept away by both the pent roof and the resin coated galvanised cladding, there is little chance of rust appearing and the shed is guaranteed against perforations caused by rust in its first decade.